Over the last five-plus years, food manufacturers and grocery retailers have helped to make once-obscure sugars and sugar substitutes like muscovado, turbinado, golden syrup, and agave nectar more readily available to U.S. consumers than ever before. Now Sweet! introduces home cooks and bakers to dozens of traditional and cutting-edge sugars and sweeteners that also include jaggery, panela, molasses, cane syrup, and many others. Drawing upon his years of personal and professional experience cooking and baking with these sweeteners, Mani Niall shows home cooks how to take full advantage of the various tastes and textures they provide with more than 100 recipes for cookies and bars, cupcakes and cakes, quickbreads, custards, pies and tarts, candy, and many other treats that showcase each sweetener’s most distinctive qualities. "When it comes to the bottom line and the final delicious outcome, the trip to the organic food store proves well worth the effort." Did you know that a mere one-twelfth of a teaspoon of honey equals the entire life's work of one bee? Or that a honey's color and flavor depend on which blossoms the bees visit? In Covered in Honey, chef Mani Niall reveals new culinary uses for honey and brings the story of nature's oldest sweetener to life, serving us food history and honey lore mixed with more than 100 delicious recipes to inspire and delight. In addition, Niall offers plenty of how-to advice such as how to store honey and what to do if it crystallizes, as well as a helpful resource guide for expanding your own varietal collection. Whether you're just starting to explore varietal honey or are a confirmed honey enthusiast, Covered in Honey is sure to expand your repertoire and delight your senses. "The curious cook will delight in the history and mythology of honey, the personal stories of beekeepers themselves, and especially the imaginative and tempting recipes from baked goods and salads to entrées and desserts. This unique and comprehensive book is already a one-of-its-kind classic." "You don't have to be a bee to appreciate Mani Niall's in-depth approach to the culinary pleasures of honey. This book promises to take the reader beyond the sweet nectar's obvious charms into a new realm of possibilities." "The time is right for honey to take its place along with other products, such as fruits, coffees, wines, chocolates, and cheeses, that we want to learn more about. Its origins, its place in a healthy lifestyle, and most important, its subtle flavors and nuances are vital knowledge for those of us who bake and cook with honey." Mani Niall's delicious and healthful delicacies will satisfy everyone's craving for goodies, from health-conscious bakers to dessert hedonists. The owner of the celebrated Mani's Bakery in Southern California, Niall has spent years perfecting his technique of baking with no refined sugar--without compromising on flavor. His Sweet and Natural Baking offers 65 recipes for such delights as creamy cheesecake, chewy brownies, magnificent muffins, tangy tarts, and even rich truffles, all made using familiar baking methods. Nothing lifts the spirits like a homemade treat -- and if it's made with wholesome ingredients, it tastes all the sweeter. "Mani Niall has become famous for the beautiful yet indulgent desserts sold at his Los Angeles bakery. 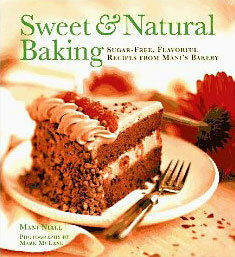 In Sweet & Natural Baking, Niall explains how to make naturally sweetened treats using only whole grain flours. (Some are also low fat, but that's not a particular objective in this book.) Carefully detailed instructions should guide you to perfect results for baked desserts, including cookies, muffins, scones, pies and cakes. There are useful descriptions of ingredients to help anyone unfamiliar with using whole grains and sweeteners such as concentrated fruit juice and maple syrup in baking. Mouth-watering photos show why Danny DeVito, Roseanne, and rock groups have made Mani "baker to the stars."